Last week, I wrote about horses who are The Strong Silent Type. This horse is the opposite. Describing him sounds like reading the judge’s comments on a marginal dressage test: Tense in the back. Tight in the poll. Hollow. Too quick. It doesn’t stop there. He has twitchy eyes, a furrowed brow, and he clenches his jaw. Sometimes his head is so high you almost unable to see around it and the muscle under his neck is stronger than the one on top. His flank feels rock hard and his breath is as shallow as yours. And it isn’t just physical. It’s the way his mind works, as well. He reacts; when a different horse might reason it out, he jumps to conclusions, usually the worst. Everything seems like it’s on the big screen; he’s dramatic and impulsive. Sometimes he gets sullen, almost pouting, and a minute later, he’s hysterical, jigging as if his hooves were on hot coals. He’s just really sensitive, they say. Really? I consider most horses on a continuum; one end being stoic and the other end being reactive or demonstrative. It isn’t that some horses are more sensitive than others; they just express their emotions differently. My horse acts this way because he’s hot-blooded, they say. Sure, some breeds are more energetic and athletic than others, but to my eye, many of these reactive horses look frightened or in pain. Can the rider truly tell the difference between personality and behavior? Are they certain he is sound? Does your horse make strange faces? Maybe he twists his neck and chews his tongue. He paws with impatience and pins his ears when it’s suppertime. Or he grinds his teeth, or flips his head, or you can routinely see white around his eyes. What if these behaviors that we correct or punish are actually calls for help? She’s just mare-y, they say. No, mares aren’t just naturally cranky. Their hormones make them more like stallions than geldings… and ovarian cysts are one of the most under-diagnosed conditions. On top of that, the discomfort of that situation could cause a secondary condition of ulcers. So, lighten up on name-calling mares already. He’s an alpha horse, they say. But just like humans, leadership isn’t the same as dominance. The herd hierarchy has much more nuance than that. In my experience, alphas like a break from trying to control the universe and enjoy the peace that comes from positive training. He’s never quite mean, they say. It’s almost like he tries too hard. Exactly! Reactive horses are responsive, intuitive, and connected. They have contagious enthusiasm, backed by intellect. They are radiant and intense and luminous. And yes, they have hearts that burst with try. Don’t believe me? Watch a thoroughbred run in slow motion. More often, it’s us that fails them. We think it takes courage to ride a reactive horse, but what if compassion is really what’s needed? Disclaimer: Horses are fully dimensional sentient creatures. The continuum between stoic and reactive is meant to help understand that horses are not brain-dead plow-horses or ditzy hotheads. They are individuals with complicated combinations of temperament, training, and past experience. Anxiety is a different thing entirely, not necessary, or permanent. There are positive solutions that will build partnership, and from that place of security, allow the horse to give you his most brilliant work. Essential point: A good rider listens to every horse with wide-open ears, accepts who the horse is, and then begins the conversation right there. How to best partner with a reactive horse? First, don’t minimize his intelligence. And you might want to sharpen your own attention a bit. Now, if you want to dominate something, control your own self; make your seat soft. Breathe slowly, deep into your lungs. Require your cues to him to be invisibly small. Most of all, don’t pull on his face. Why make him feel claustrophobic when the responsibility for elastic, soft contact belongs with the rider? Horses and humans both tend to speed up when they get nervous or think they’re losing control. Resist the urge. Go slow. Runaways happen one step at a time and if it seems like the energy builds stride by stride, perhaps he’s never been taught the joy of a downward transition. (Stoic horses excel at this.) Reward him for doing less. Walk a lot, then ask for a trot, but in just a few strides, before he accelerates, exhale back to the walk. Repeat, and for now, always bring him back before the anxiety grows. (Neanderthal training methods would say that you’re teaching your horse to quit by cuing a short trot, but nothing could be farther than the truth. Running a horse until he’s tired and submits doesn’t train him; it institutionalizes anxiety.) Downward transitions allow his trot will be more relaxed because he knows how it ends. Teach half-halts and halts from your leg. Leave his face alone. School lots of downward transitions, with immense praise. Breathe. Let it be a slow dance. Reward the least thing, so he understands that less is more. Let your mind be slow; he’ll take the cue from you. Give him the confidence to let go of his fear and know he doesn’t need to try so hard. Then, when his poll is its softest, shut-up, jump down, and step a few feet away from him. Watch him bask in the glow of being anxiety-free. See him stand quiet and still, let his eyes go soft, and droop that bottom lip. Confidence is the greatest gift any rider can give their horse. Period. The ultimate goal is riding well enough to help each horse find the center of this stoic/reactive continuum. So, with trust and contentment, the horse is free to feel the dynamic strength and power of his own body. Relaxed and forward. And I bet when we jump down we get to hear that beautiful sigh! So wonderful to read this. Not patting myself on the back, but I think my “reactive horse” is the one with whom I have the strongest bond. He is a beautiful soul and I think we “get” each other. I love that you gave this nod to the “reactives” Anna. Thank-you for such wonderful insight and the way you express it. Yes; and judging “reactive” as bad would be a huge mistake… thanks for this great comment… good for you, Jennifer. Even better for your horse. I have a similar experience as Jennifer. My welsh pony is very anxious and was a total failure at being a school pony. However, when he feels safe and knows his job he is a total brick – go anywhere. Just don’t throw new things at him and don’t, don’t do anything he can associate with bad Parelli style work or suddenly drop the contact at the ends of the arena. He is my best boy and it is as though he gives back to me with extra all the stability and consistency I give to him. Confidence and trust. Amen to both of you. Thanks, Carroll. Yikes! I’ve been in that spot. Quite an “opportunity” to expand riding skills… Good luck, Sandra. Keep breathing! I have one of these horses…I agree wholeheartedly with your assessment. Taking the time it takes, we are very much bonded! I have learned so much from her. Wonderful! Good for you, Karen. Thanks for commenting. What little horse/womanship I have developed over the years (and I do mean little) I owe to my reactive TB. Sure, riding my stoic Appy was fun…deluded me into thinking I was a real horse woman on the trails. Truth be told, I was just a passenger. It was my reactive TB who taught me there was so much more to horse/womanship than just being able to stay on his back! Even through the most trying times when he would buck and spin, I would be thinking, “What am I doing wrong to invoke this behavior?” Reading your blogs have helped me tremendously (THANK YOU!) but also served to confirm what I always felt in my gut this horse was asking of me, to have a say in our partnership. Thanks, again, Anna. Well, isn’t this comment the story of riding… I used to think I was something… then I found out I was riding the outside 1/8 inch of my horse. That’s when things get fun! Thanks, Lynell. I was at a Buck Brannaman clinic a couple years ago and found many things to disagree with him about. The first being, “If I have a young, green, anxious horse, I just ride it 50 MILES til it isn’t so anxious and spooky.” I was floored, wondering if he, as an experienced horseman, would do this to his OWN young green horse, or just a client’s, whose longterm soundness may not be important to him. I still shake my head at this philosophy, but he was not joking. If horses are disposable, this is a great method. I enjoyed your post today because I just got home from doing a ride very like you described. Spiralling in and out, trotting one circle at a time, relaxing. Training myself to use my seat cues for turning and leg yielding and stopping. And the reins are just there for my emotional benefit if I need them. 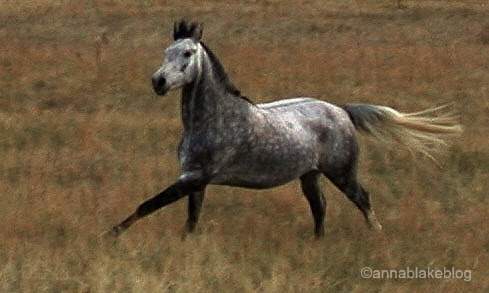 I’m so happy to have a non-reactive young Arabian. My cues today were visualization in the form of rhythm in my head. Wow how that works (Rashid). The horse knows rhythm much more than he knows aids. Thinking rhythm is, in my experience, the most subtle way of changing gaits. I’m dealing with a lot of anxiety and feel guilty that my young horse has to deal with it. But somehow he is, cuz he’s atypical. Buck and I disagree on a few things… Thanks for the insightful comment, Lytha. OMG, my Arab gelding to a T! He is anxious and nervous and tries SO hard. He came from a big Arab show barn where he was treated as a commodity and developed so many bad habits. He is super sweet and he has taught me (an A-type) so much about being quiet and calm. Your advice about deep breathing and patience have helped both of us so much. Thank you for your insight and your way with the “pen”! Please keep writing! I was a student of an Arabian for years; such great teachers. Thanks, and no fear. I’m nowhere near shutting up about horses. LOVE this observation. Some riders feed the horse’s anxiety because they are fearful of the power underneath them & lack confidence in their own abilities – too often they label the horse unfairly. Wholeheartedly agree. Thanks for another great post. Agreed; I think for some it never occurs that anxiety can be released. Thanks, Mrs. Shoes. Thanks, Anna! I have a 27 years young OTTB whom I still ride 2-3 × per week! What a good boy he is! We’ve had him for 20 years, and I still wonder if his early training @ the track gave him “carry-over” anxiety. However, at times he’s reactive, at other times, not so much. We do a LOT of breathing, and, if he’s a bit too “frisky,” I’ll sometimes just walk and trot; then, I’ll get off and hand walk him! Nice to have the freedom to do that after years of trainers telling my daughter and I that “you shouldn’t let him get away with (insert misunderstood reaction of horse here)”! Plus, I’m 60 and have NOTHING to prove about my riding. I just want for us to enjoy each other’s company and avoid injury! Perhaps that’s the same thing he’s thinking for himself?! Great comment, Kathy. What if the ones who get to ride the longest are the real winners… not that there is anything to prove. Thank you. Nicely done! Great advice! I recently rode a more tentative horse than my own stoic fellow. At the walk, I could feel his nervousness. I asked for walk/halts to help him realize I wasn’t going to ask for anything strenuous — and that he could trust me to be fair. Once those were going well, the rest of the ride was lovely. What a positive way to introduce yourself. Good riding. Thanks, Lauren. The horse I have now is one who has responded well to having an owner, his very own personal person. He is now much less nervous and spooky. Spending time with him not riding is part of this ( I have also found Tellington touch and ground exercises were very helpful). I so agree that horses are sentient and intelligent beings. Thank you for this post. Thank you, Anne. It sounds like you and your horse are doing well. I’ve watched a beautiful chestnut standardbred gelding and his owner/rider at the annual Horsefest and if there was ever a “high-strung”, nervous, reactive horse he certainly is a poster horse. Granted, it’s not the best time or place to observe horse behavior with lots of strange horses and plenty of people around. But every time I’ve seen that gelding, I’ve cringed. It’s like looking at a bomb with a lit fuse and wondering if you’re going to be able to get far enough away to avoid being blown to bits. There is nothing relaxed, head high, worried look, tense, ears never stop moving, prancing, not looking to the rider/owner for anything. Watching them in the arena beyond painful with heavy bit, double reins, head tucked tight to the neck, body bunched. The poor gelding didn’t even relax in the box stall, backed into a corner, watching the door looking for an opportunity to run, trying to back further into the corner when the owner showed his face or his voice was heard. I can imagine the hell that poor animal exists with. It’s been like that for at least the last 10 years. That is no partnership, I suspect much just from the gelding’s behavior. The owner boasts about how much in control he is, how he makes the gelding behave. I’m surprised he hasn’t been openly attacked – yet. I’ve seen other people who have reactive horses there too, but none of them come anywhere close to this one guy. I’ve seen poor choices by owners, but most of them just put the horse in the stall and close the door, giving the horse a chance to decompress from all the hub-bub and noise or take them for a walk on a loose lead along the riding trails and away from the people and other horses. Just like with a reactive person, you’ve got to give them a chance to relax, regroup and know they’ve got someone who will watch out for them and be calm for them. Watching them just infuriates me. There is no excuse for a horse in that condition. I want to just grab the reins or lead and tell the guy he can’t come near that gelding again. I think I might even have a photo of the horse. Oh, I am in the middle of the spiral here with my over reactive too tall beautiful fire horse. Trying to build trust after all these 5 years, I think it’s working…the depths of her still point matches the other end of the spectrum in her and i…learning exactly what is needed for my evolution as a human and I realize she is on a path of evolution too…as uncomfortable as it is…I love her so…. A beautiful description of a work in progress. These are the good old days… Thank you, Sabina. All I can think of is, it’s the most precious gift of all to be with someone as they are so that they can be at ease even with someone else. I totally get that trapped prey response but with the willingness to act acceptably because otherwise you know that you’ll be punished. I’ll never really get why some folks think punishment is the way to get what they want when all they have to do is ask and wait. In my experience, we aren’t all that good at acceptance, we humans… or was that a rhetorical question? Thanks for this comment, Joan. Is that a rhetorical question about a rhetorical question? Being me I’ll answer both lol. It’s a rhetorical question if asked and often not even on the radar to be asked by those who protect themselves by inflicting pain on others. Hi Gina, thanks for taking the time to read it! What can anyone say after that? It could be so much worse; you could think it was his fault…(Sorry for the bad joke.) And good for you. Better next time, I’m sure. Thanks, Christine. Obviously time is a human concept but I think animals understand instinctively the number of sun-up, sun-down the other animal has seen. I’m tempted to not call it ranking. Do you think my young horse recognized the 6 month birth-difference from the horse who was supposed to be his role model today, but instead, my horse was? Interesting day… but to the question; I don’t think they know ages, but I do think maturity matters. But there are mature 4 yr olds and very immature 10 yr olds. (6 mos, not likely) It’s the best thing about horses; anything can happen. Thanks for the comment. I just love these two types Two such different horses, but, actually at the end of the day pretty much the same, both wanting to do the right thing by me and both presenting me with so much to learn about their emotions and how to adjust mine accordingly. The best thing about having such different horses is that, as a rider, you learn to not be complacent… it’s kind of a gift if you think of it that way. Thanks, again, Melissa. Wonderful comment. The best part is that he’s young; sky’s the limit when we listen. Great comment, Kari. Lovely words, may they help turn the tide as to how we treat horses. I hope; we’re kind of hard on horses, too much of the time. Yay, for a more enlightened path and even more for a Grandma Horse. Thank you, Cat. This is beautiful, and I love the point that the most important thing is to have compassion for these horses. Along with ulcers, I’d suggest allergies as another potential contributor to reactive behaviour. There have been times when my gelding’s allergies so irritated him that he would react to air currents (not even at the level of wind). Under those circumstances you can’t ask them to focus until the physical issue is resolved. I’ve always been drawn to this personality type, and I find that they respond really well to a problem-solving approach (i. e., my attempts to understand what they need in a given moment). Another thing I’ve noticed with a lot of reactive horses, especially the ones who tend to spook, is that they like to know that their rider is aware of the environment, not in an apprehensive way, but in the way a horse would be. In this way, the rider can actually contribute something to the horse’s sense of security, rather than being a predator on board. Whether riding in an arena or on the trail, I try to scan the surroundings with soft eyes, so that I notice what might be coming at least as soon as the horse does. The key, I think, is not to tighten up in anticipation. The other thing that I find really helpful with these characters is to be able to “reset” quickly if something (like a spook) does happen. You can’t “hold a grudge” or remain tense in your own body/mind. I’ve been lucky enough to have a lot of Arabians in my life. I always say that they calibrated my energy level where they wanted it, which has been a huge help in working with reactive horses in general. Great comment, Tracey. I owe most of my wits to riding Arabians. Pingback: Simple Pet Love | Do You Communicate Like a Coyote? I lost my best friend a few years ago. in hindsight she was totally shut down. I am not a confident rider and she was sold to me as being “perfect for me”. In actual fact eventually she was, but instinct was my guide. Humans were harsh, so she drew comfort from my gentle boy who every horse seems to want to hang out with. So I just started hanging out doing things with him in tow too. Then we started walking out through the trees on our own, a little bit further every day. I started by getting on and off, until one day I had rode the whole route, singing all the way round. She didn’t much like competitions, and I’ve heard tell she was loped in for 3 hours to get her quiet. But bless her, we did a few and we romped the blues, and although I wasn’t much good…boy she seemed to love showmanship more than being ridden. During our journey, I learnt the value of groundwork. But most of all, I know she felt the joy she gave to me. My new horse has caused me many sleepless nights, but taken me on a journey where I am meeting wonderful people to guide us. I’ve learnt just as much about things I want to improve in myself, as I have in seeking out training methods that sit right with how I want to interact with my horse. It’s been nearly three years with my new partner, she is reactive and anxious, so your post is very timely. I am ashamed to say it took me too long to realise that she is intolerant to alfafa which caused ulcers. Since that time, we are going from strength to strength. She has taught me to slow down and be patient. Magically I am losing my riding anxiety because I’m more concerned about her feeling calm, that I ask a little, keep it slow and simple, and start from the beginning every day. Thank you Warwick Schiller for this advice, along with your never ending support and the search of your own self development. Many of us are now enjoying your blogs Anna after his recommendation on his fb pages. Kim, I know you are new to my blog, but this comment sums up most of what I teach. Good for you for listening and taking a negotiated path with your horses. I love the idea that you are distracted from your anxiety by listening. It gives me a smile, I see it in my clients, too. Finally, I write about ulcers often; they are an ongoing issue. Usually a bit of alfalfa a day is a good support (calcium is good for the acid) so I’m surprised to hear that your horse had the opposite response, but being aware of ulcers, especially as your describe your horse, is crucial for you and her. Thanks, Kim, for this wonderful comment.